A lot of faith in the future at this Show. 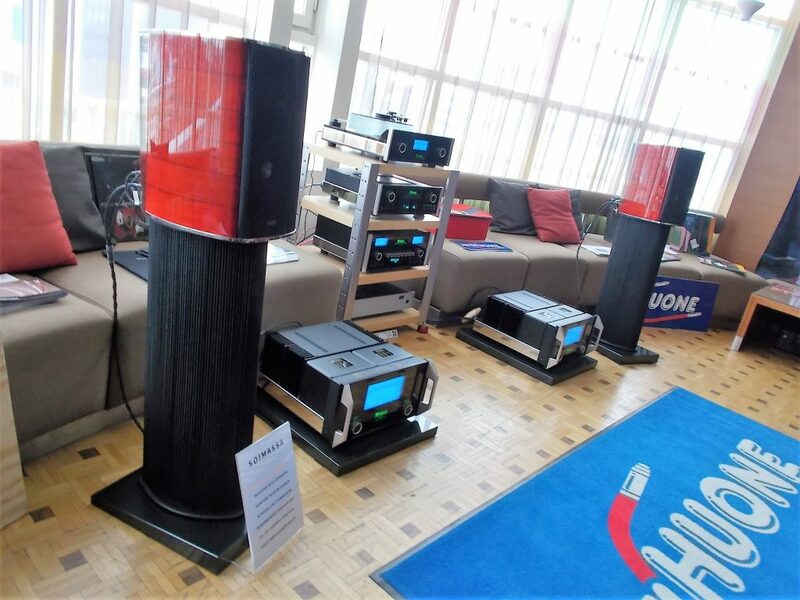 Concurrently with the Show in Rome in March, thirty or so hifi importers/dealers gathered at a hotel not too far from the Helsinki/Vantaa airport in Finland. The event was continuation of similar shows previously organized in two other cities. 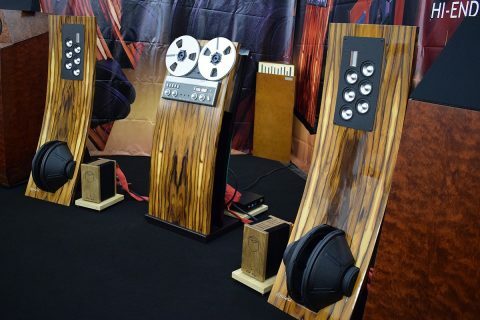 The main purpose of these particular shows is to bring together exhibitioners who more than what is pehaps typically the case at hifi shows, invest in the quality of every aspect of their systems, and tempt like-minded hobbyists. Nice atmosphere, and positively forward-looking. Some samples below. 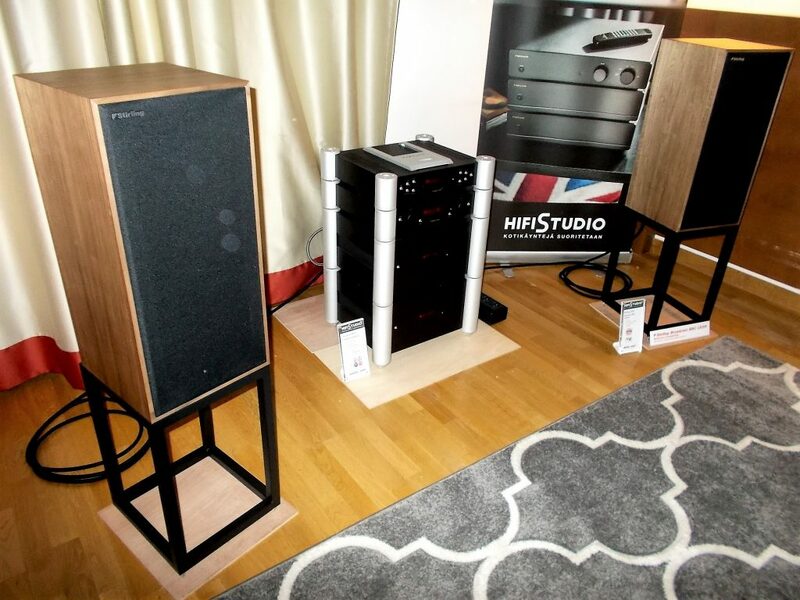 A specialist in esoteric hifi, Starsandstripes demoed two quite interestingly and competitively sounding (eg. 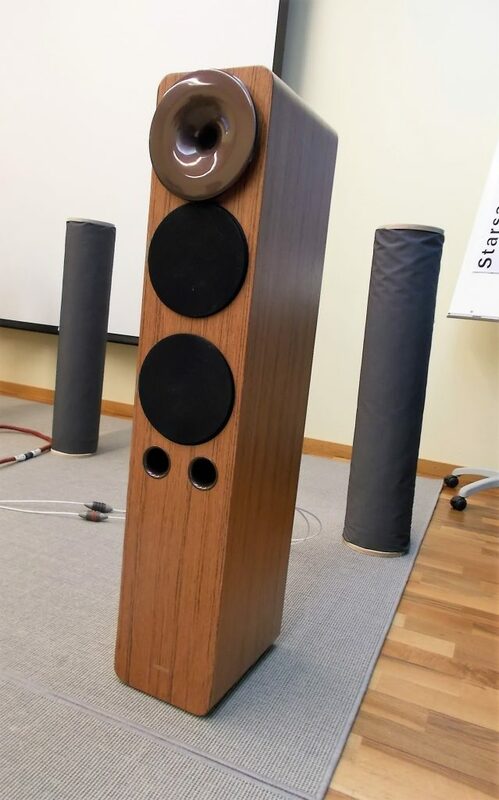 full of energy and openness) loudspeakers. The one was Cube Audio Bliss C (3890e) (left) with their own rear-loaded widebandwidth driver. The other was Horns Aria II, a 2-way with a short tweeter horn (4790e) (below). 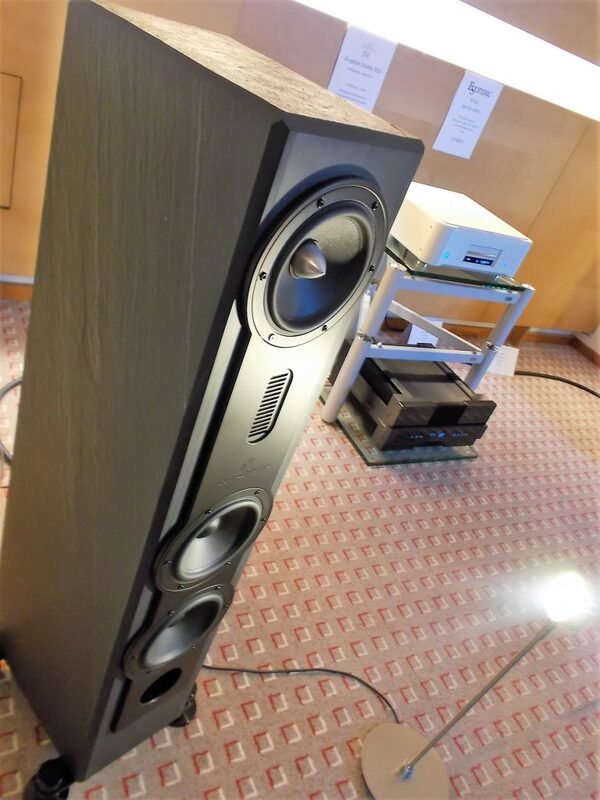 The speakers were powered by Spec’s fantastic RSA-G3EX integrated amp (5990e). Cabling was realized with much hailed High Fidelity Cables’ wires with one exception: the 13 500 euro power cord by A. Charlin! The CD player was the mighty Ayon CD3sx (9985e). 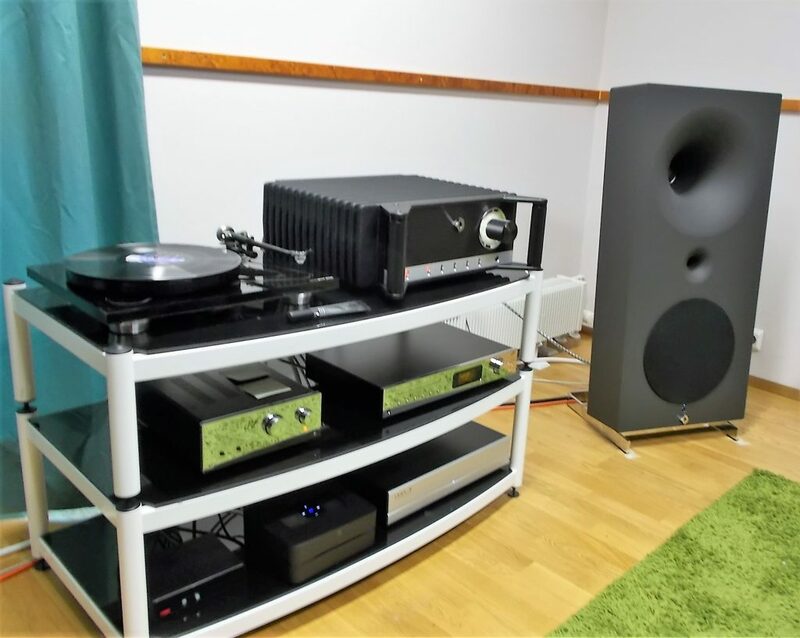 Not the highest highend but a very sympathetic system (AH-Hifisystems) featuring SA Pandion 20 loudspeakers (5649e), NAD’s NAD MASTERS M32 amp/dac and a new M50.2 network player (4750 e). The chosen Ortofon Cadenca Blue cartridge (1499e) cost twice as much as the Project RMP 3 turntable (649e). The equipment rack was Quadraspire X-Reference. 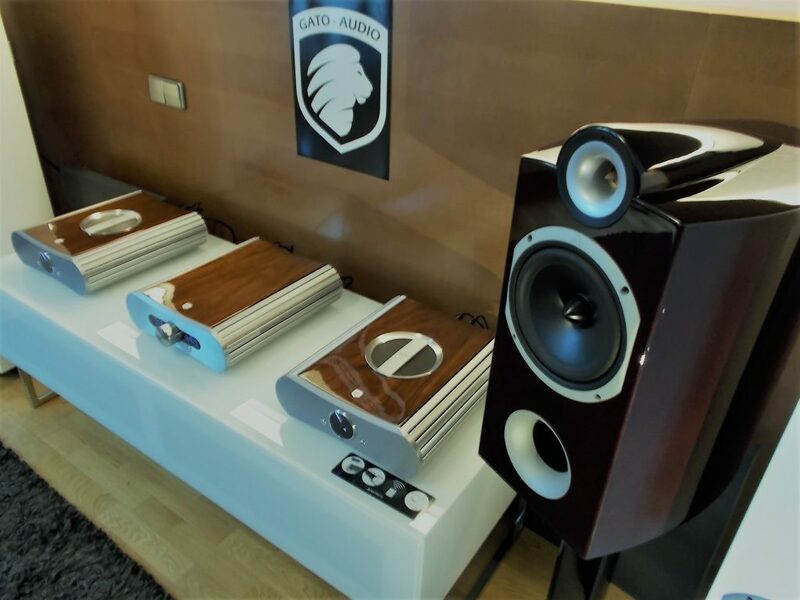 Talking about elegance, talking about airiness of the sound! MartinLogan Impression ESL 11A (14100e per pair) with a newly designed panel and 2 x 8 inch woofers. 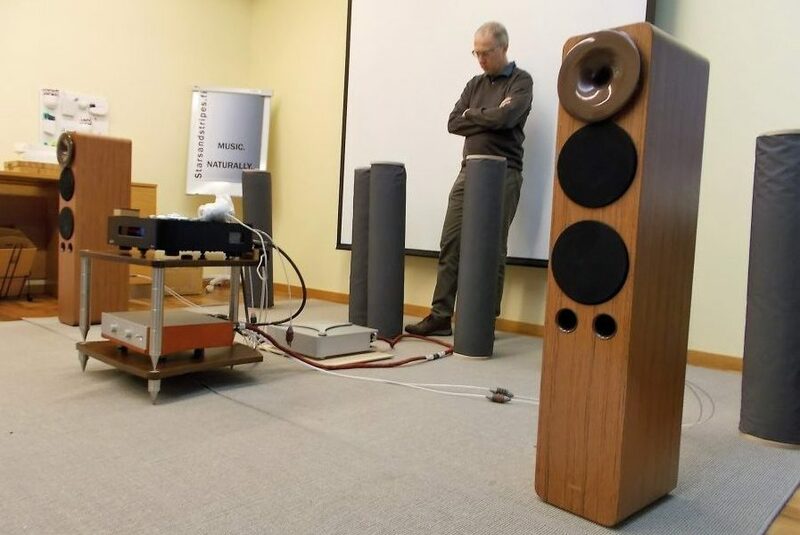 Is this the most sophisticated looking MartinLogan ever? 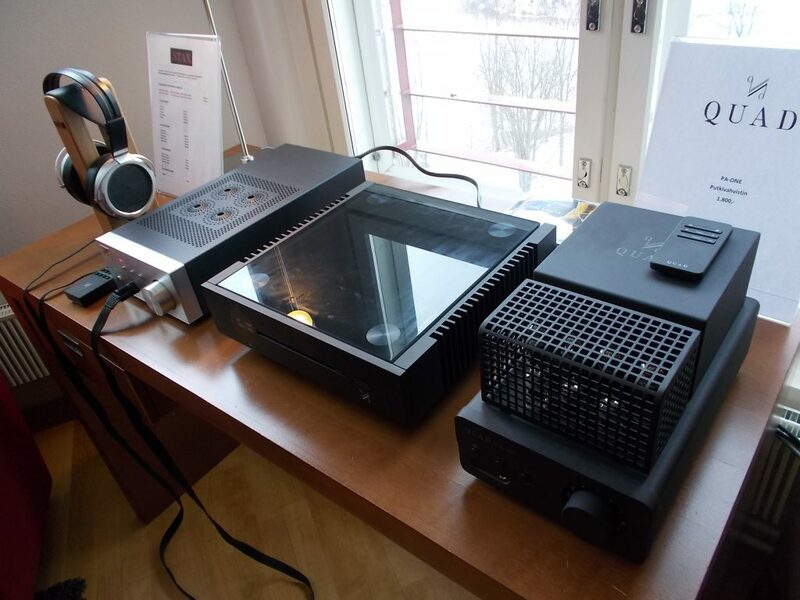 The signal sprang fom Melco’s digital players and Audionet amps. Musical Fidelity hasn’t given up the military Nuvista tube from the 1950s. 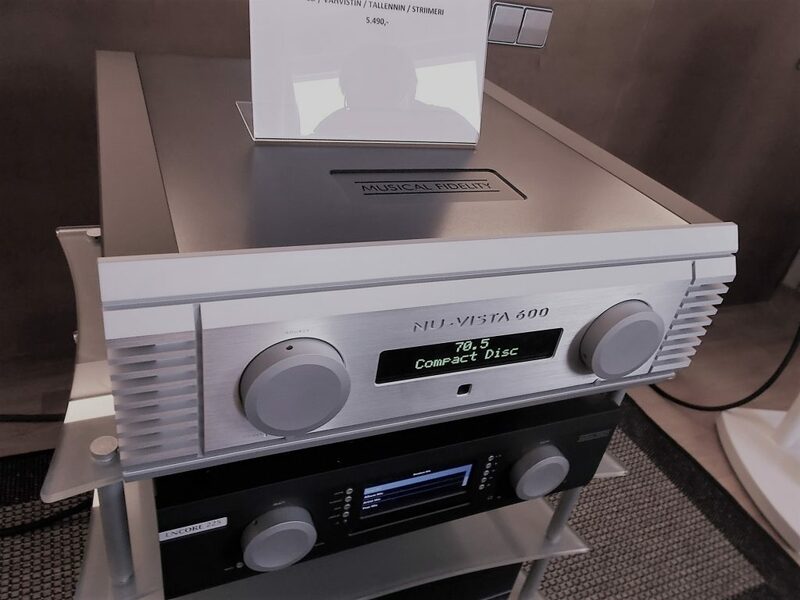 The latest incarnation of the theme is the impressive looking Nu-vista 600 amp (6990e). 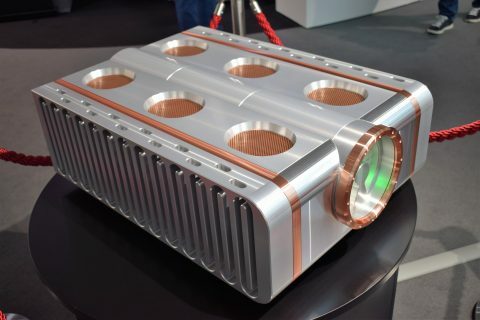 The 200 watt smasher can reportedly drive almost any speakers and do its stably, this time big Cantons (Audelec room). 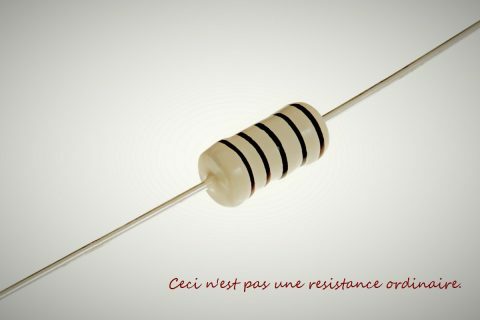 To the fore, Quad’s new tube and transistor electronics. 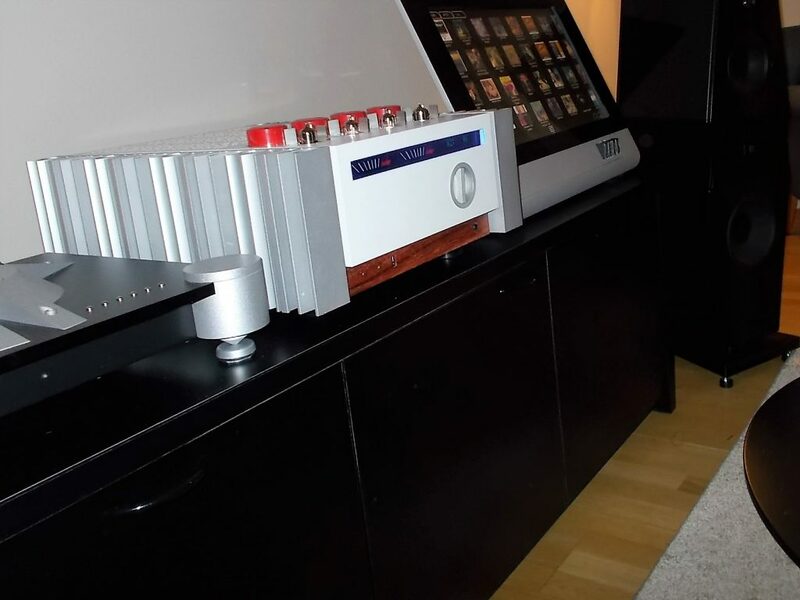 Arcam’s massive P49 power amp (4499e) in command of the Danish Audiovector SR-6 (10800e) loudspeakers with a great sonic end result. 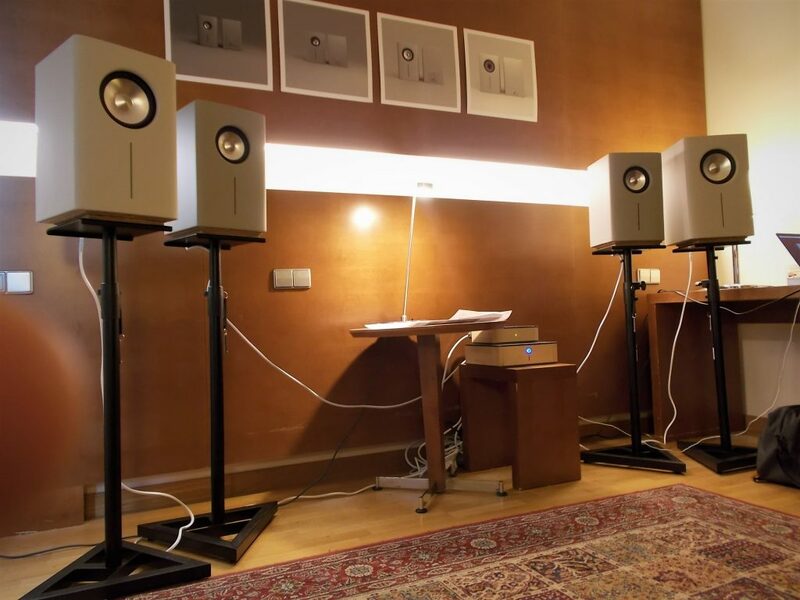 From the well-groomed looks it is hard to conclude how much techniques has gone in the loudspeaker (Hifimesta). Hifiklinikka’s Transrotor ZET 3 TMO TT tower (4200e + 3000e) carried this time Benz-Micro Ruby 3 S cartridge. Verity Audio’s Finn speakers were hooked to Fezz Audio 2 x 45W Titania, Class AB1 tube amp with 4 x KT88 ja 2 x 12AX7 by Electro-Harmonix. Cables from the Finnish TK Cable. The Show’s best tribute to Leonard Cohen. 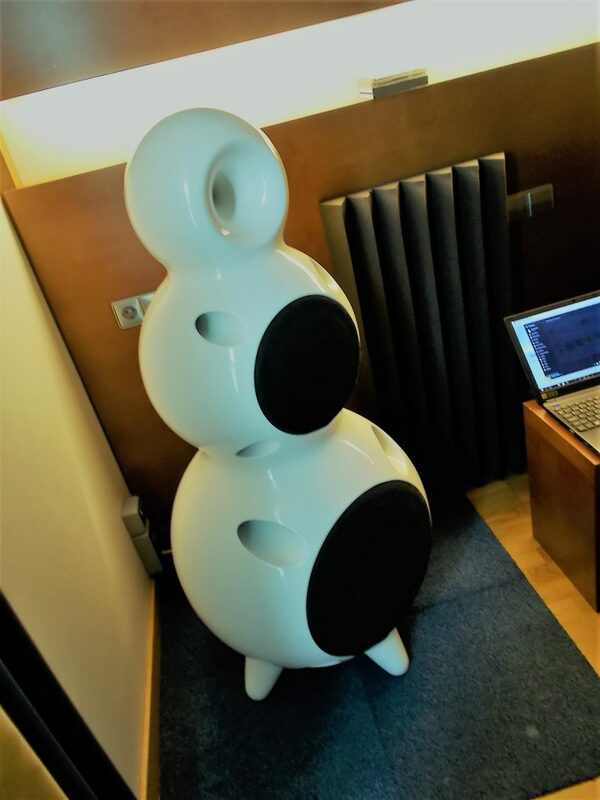 DreamSoundWorks sells its weatherproof snowman speaker to tropical countries, for circumstances in which “ordinary speakers would last only a week”. The speaker sports a 15 inch woofer, 8 inch midrange driver and 1″ horn tweeter, and the cabinet is made of a composite material. One of the showstoppers definitely was the Swedish/Finnish Entire whose ported (or should we say “slotted”) widebanders impressed with their unforgiving but still pleasant sound world. 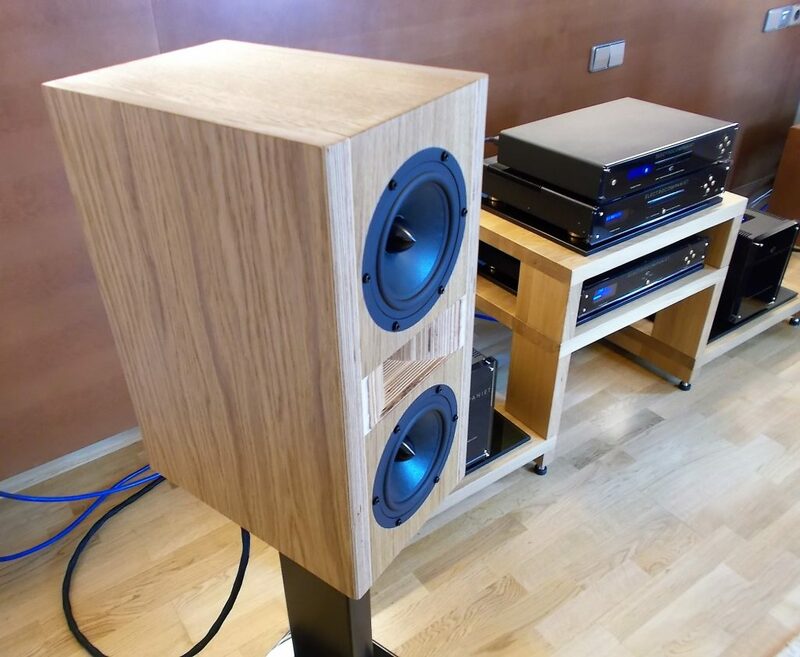 At the heart of the four speakers models (S, M, L, XL) is the Swedish EAD widebandwidth unit, the diameter (60 – 170 mm) depending on the volume of the cabinet. 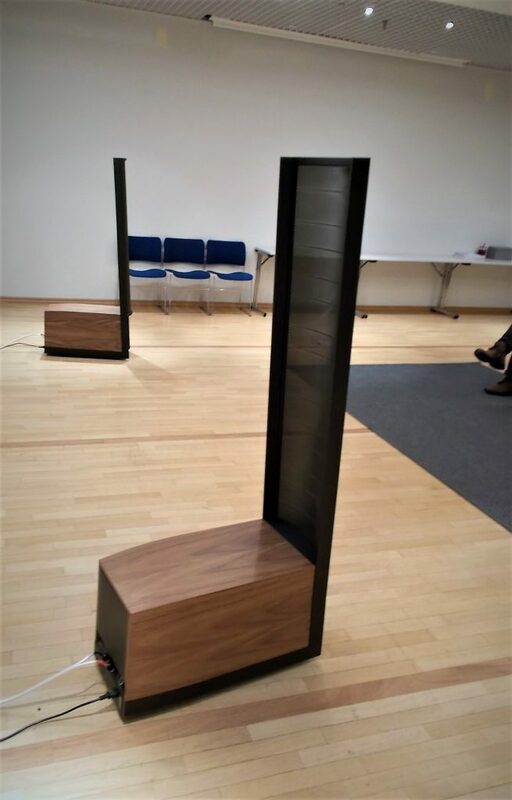 Given the size of the cabinets, the manufacturer announces fairly low bass resonances, but subjectively assessed the figures made sense. Prices for a pair range from 720 euro to 3032 euro. 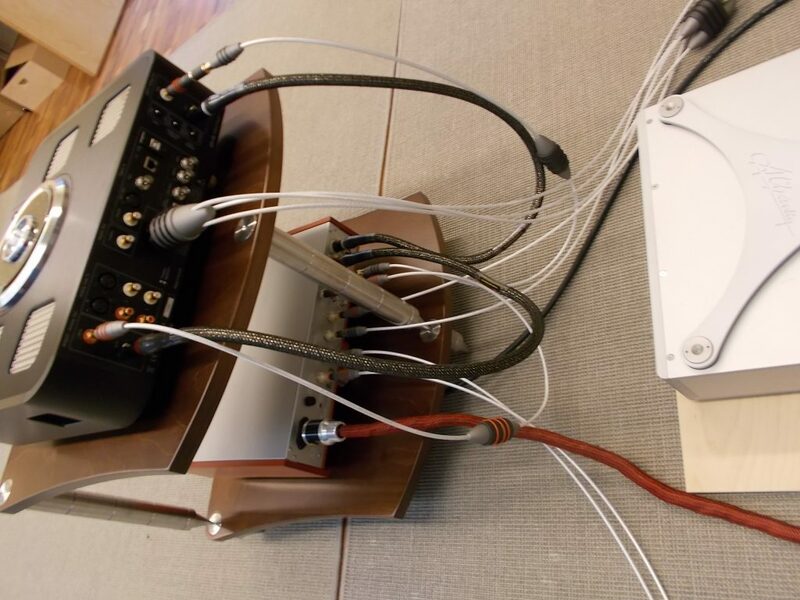 This DIY-based dipole speaker (Aaninen) looks like a mature commercial product to my eye. 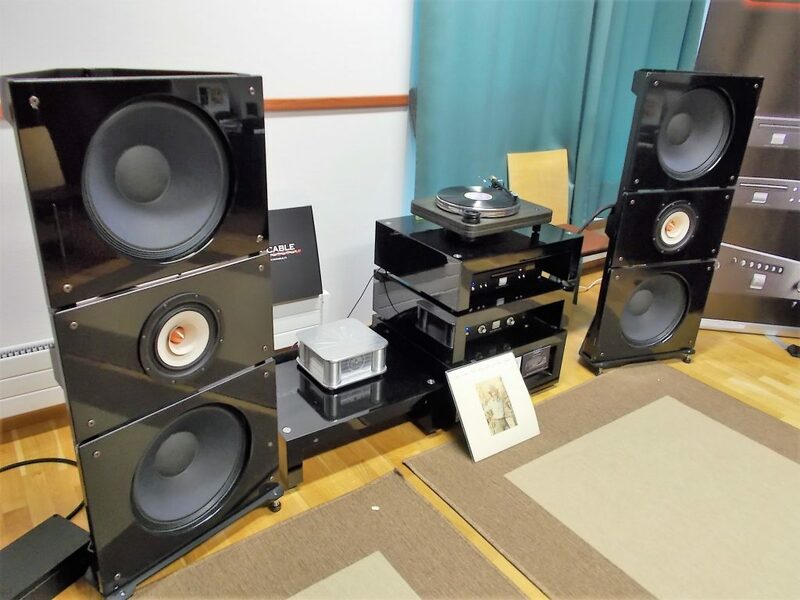 The Spendor & Cyrus Audio combo got a challenger from another British classic brand Stirling which manufactures loudspeakers with the old BBC recipe such as Stirling Broadcast BBC LS3/6 (2500e) originally from the 1970s. Electronics by Exposure. 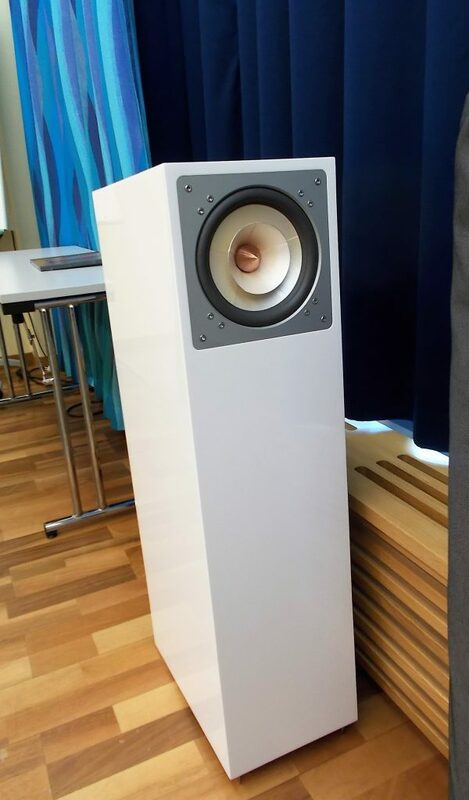 The Finnish Solaudio demoed its brand new 2-way stand-mount speaker Flarea with a horn-loaded ribbon tweeter and aperiodically tuned woofers crossed at 2500 Hz (4280 euro per pair). 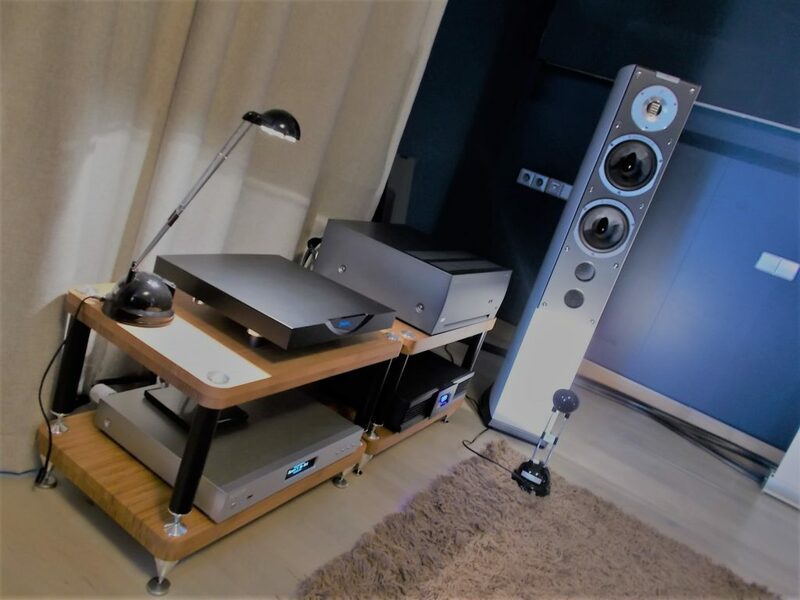 A secure performance from Fischer & Fischer loudspeakers run by Gryphonin Diablo 300 integrated amp (15900 e) and Esoteric’s massive K-01X sa-cd-player featuring a 35 bit da-converter (19990 e). 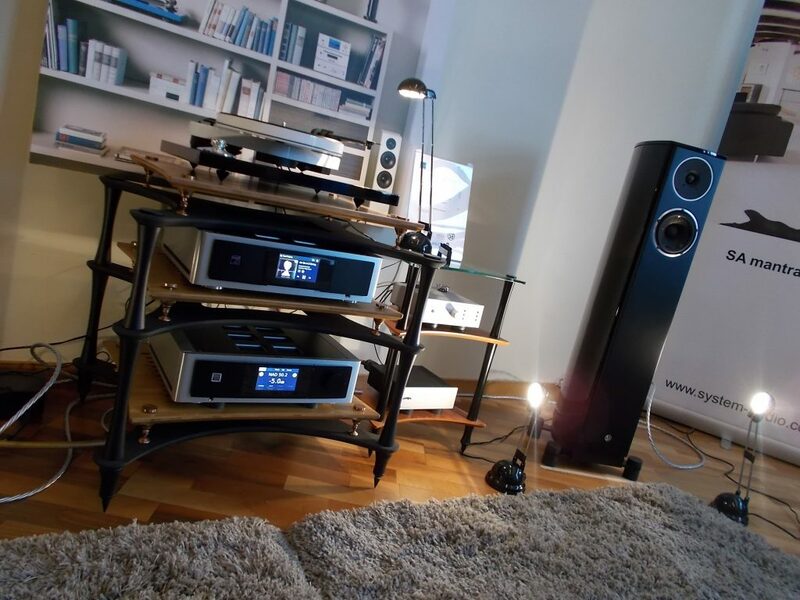 This fabulous Italian/American system was put together by Hifihuone. 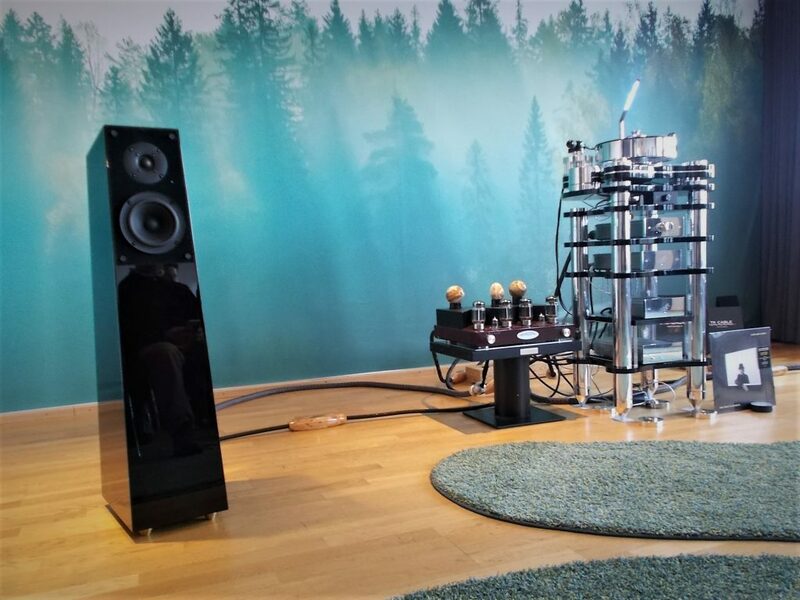 Sonus Faber’s divine Quarneri Evolution (16990e) led the orchestra supported by McIntosh’s mighty 600W MC601 transistor mono blocks (11300e) in the background. 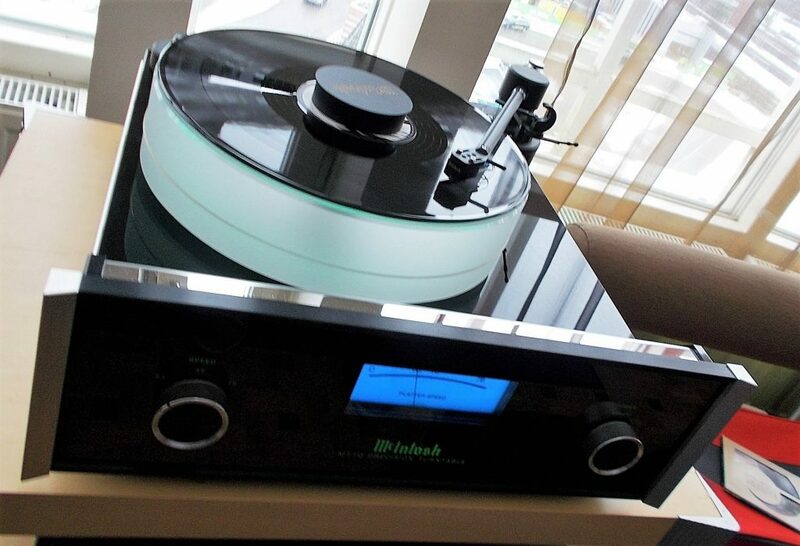 The McIntosh T5 turntable (11000e). 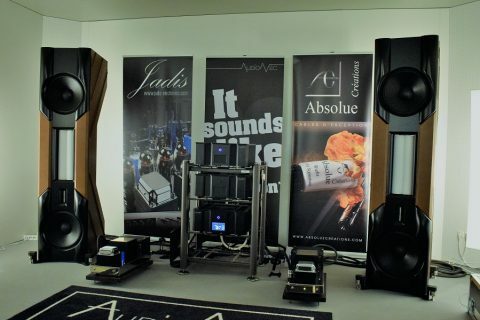 Avantgarde’s active Zeros with Avantgarde’s own amplifier won hearts and mind of many show visitors. 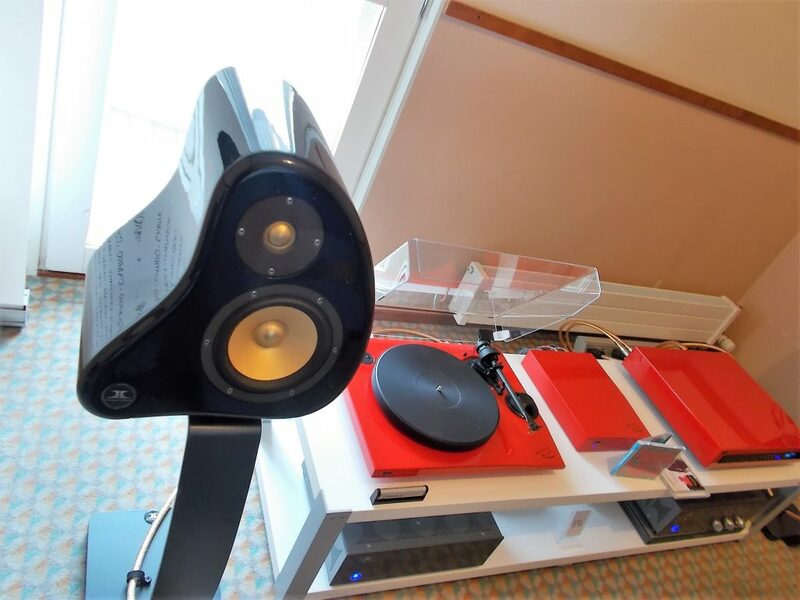 Nippon Hifi’s room demoed the Pear Audio’s captivating wooden Captain John Handy turntable with Shelter mc501 cartridge (Koitto Phono Stage 1), together with a speaker assembly by Pure Audio Project. The model is Trio 15TB Neo and the driver Tangband 7 incher (can be replaced with a Voxativ or a horn unit). The clever part of the speaker is how it enables tuning the sound eg. by swapping components in the crossover. Trios were driven with a matching small power SoulNote SA 710 amp (2200e) and SC 710 cd-player (3000e). 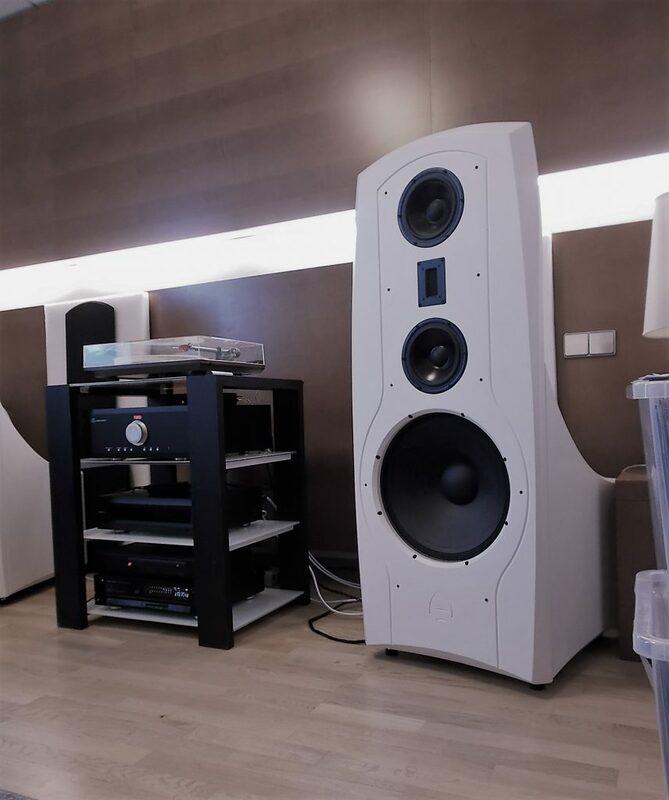 Last but not least, Fine Tune Audio’s room revealed unusual looking ported Ensemble Ondiva Gold monitors featuring 18 cm woofer and 28 mm tweeter. The announced bass resonance is 38 Hz. The amp was also an Ensemble while the source electronics came from Oracle. A small system but very highendish. Part I: tape recorders, turntables, CD players. 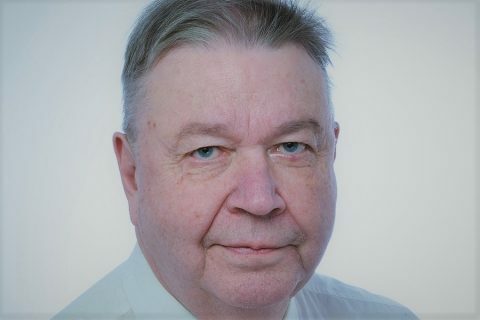 One of the great minds of loudspeaker building, Jorma Salmi passed away on Sunday 27th May 2018. Along with him we lost not only an enormous amount of technical knowledge and understanding but also a civilized and a good-hearted man.